This meet to the Outer Hebrides was attended by LMC stalwarts Richard Toon, Dave and Julie Sudell, Dave and Pat Buchanan, the honourable Jason and Joanne Whiteley and yours truly. 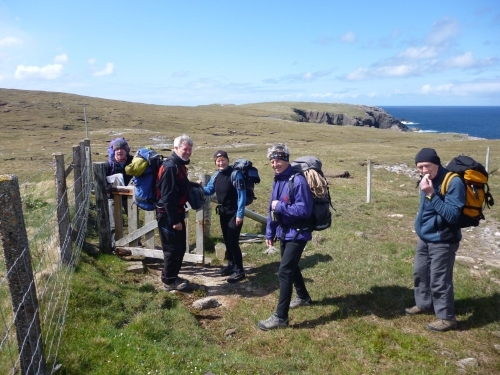 We decided to camp on the west coast of Lewis at Valtos close to the sea cliff climbing which is largely around Uig and also further north. And what a windy campsite it was, catching the sun in the morning but decidedly cool in the evening with the continual wind forcing us to seek refuge in Dave and Pat's tent which seemed to be amply supplied with ale. 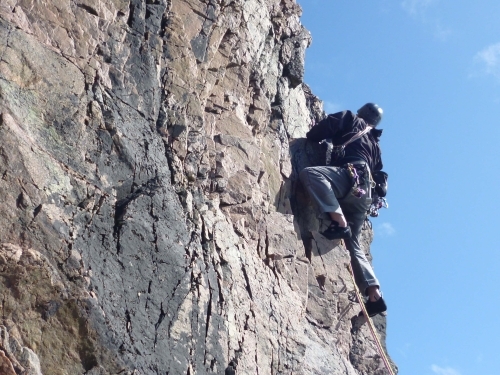 Despite the wind we enjoyed consistently good weather which allowed us three days sea cliff climbing around the Uig area and further north. The rock is the eponymous lewisian gneiss and nice it is being generally steep but solid rock with good protection. Richard and I also had two days mountain cragging, firstly a 300m HVS on the Teleesadale slabs ending on the summit of the mountain and secondly a shorter HVS route of about 120m in the delightful and remote Glen Uladaile. This is home to the spectacular hard rock route Scoop and near other very hard routes being close to 20 pitches, but of course we are in the land of the midnight sun, where early starts aren't really necessary. Lewis - Harris is a truly delightful place, unspoilt with unlimited scope for mountain walking, biking, fishing, cragging and general mountaineering providing you're not obsessed by Munros, because these hills are not massive but they are shapely. Some culture as well with Harris Tweed jackets popping up from nowhere and Neolithic stone circles almost at every turn of the road. The famed Callanish stones being well preserved and the visitor experience complete with an excellent coffee shop. And to top it all Dave and Pat managed a day trip to St Kilda which definitely sounds like the end of the earth. Watch out for the photo comp...!